Skip the coffee house and brew your own delicious Peppermint Mocha Latte in a Ninja Coffee Bar® System! Heading out to the local coffee shop on a daily basis can cause a serious dent in your pocketbook. I have a serious love for coffee but not the cost of ordering my favorite coffeehouse special. When I first started enjoying coffeehouse drinks, I was intimidated by how the barista actually made the drink. It seemed like so many different steps. Often too, the name of the drink was equally hard to remember. Fear no more, I have now learned to make coffee house drinks right in the comfort of my own kitchen. Thanks to the Ninja Coffee Bar ® System, I can now be my own barista and enjoy an authentic hot or cold coffee drink right at home. The Ninja Coffee Bar® System includes a built-in hot and cold frother, six brew sizes and five brew types – including the Ninja-exclusive Cafe Forte brew, which amplifies the natural subtle flavors of your favorite coffee. Whether you are a fan of a hot or cold brew, the Ninja Coffee Bar® does it all. It’s perfect for entertaining too. I can’t wait to set up a “make your own coffee bar” for the upcoming holiday season. 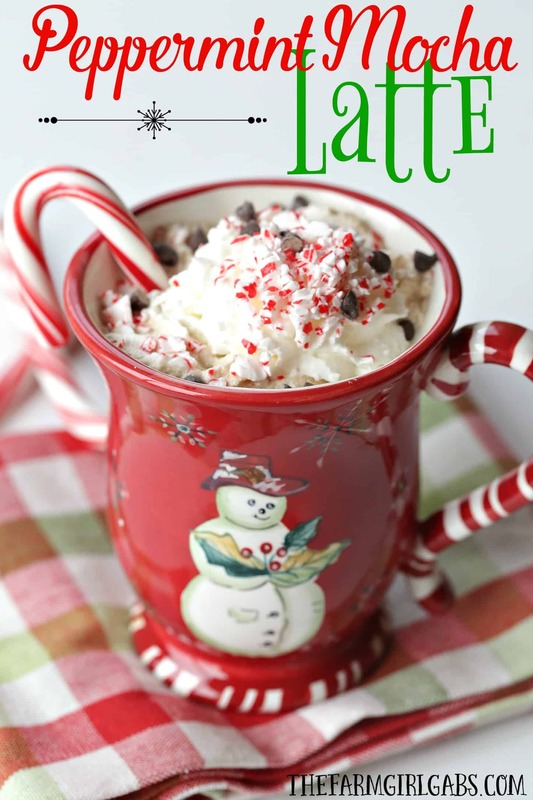 Since the holiday season has kicked off, I thought it would be fun to create one of my favorite seasonal drinks with the Ninja Coffee Bar ® System that I always order at the local coffee shop – a Peppermint Mocha Latte. Again, this is one of those drinks that sound so intimidating to make but it isn’t! Start by mixing some cocoa powder and water in a mug . I added about one tablespoon of a mint simple syrup that I made too. Use the attached Ninja Smart™ Scoop to fill the filter with either espresso or strong coffee. Make sure the water reservoir is filled too. Place the mug on the single-serve platform and choose the specialty setting to brew a four-ounce cup of coffee or espresso. While the coffee is brewing, heat up some milk in the microwave for about one minute. Use the built-in milk frother to froth the steamed milk. I love the convenience of having the built-in frother. Pour the frothed milk into the mug. I like to garnish my Peppermint Mocha Latte with whipped cream, crushed peppermint candy, and miniature chocolate chips. I totally brought out my inner “Ninja Barista” with this drink – delicious and money-saving too. It’s the perfect drink to ring in the Christmas season. A Ninja Coffee Bar® System also makes a perfect gift to give too! There are also a lot of great recipes included in the box as well. Combine 1/3 cup water, 1/3 cup sugar and 2 teaspoons peppermint extract in a small saucepan. This will make your mint simple syrup. Bring to a boil for one minute. Remove from heat and set aside. Add cocoa and 2 tablespoons of water to a large mug and mix together. Add two tablespoons of the mint simple syrup to the mug. Place mug on the Ninja Coffee Bar® System and brew 4 ounces of espresso or strong coffee on the Specialty Setting. While coffee is brewing, heat one cup of whole milk in the microwave for one minute. Use the frother on the Ninja Coffee Bar® System to froth the steamed milk. Slowly add the milk to the coffee mixture. Stir gently to incorporate. Garnish with whipped cream, crushed peppermint candy and chocolate chips. That Peppermint mocha looks delicious! Such a fun machine! Would love to own one too! I would start with making a peppermint mocha! I have3 had my eye on one of these for quite some time. Wonderful recipe! OMG, the Coffee Nog sounds Delicious! First thing I would make! Would love to try the Coffee Nog. Thank you! I want to make corn soup with chives. I love peppermint mocha, especially this time of year!! I’d love to make the French Vanilla Cream Forte! Sounds delicious! The Gingersnap Iced Coffee sounds SO good! I like mine simple: a plain old mocha. If I’m feeling froggy, I might add some coconut syrup! Southern Sugar Pie Iced Coffee Sounds amazing. I would make the Cinnamon Toast Coffee. Oh my goodness! Me too! Sounds DIVINE! I would really love to make a peppermint mocha latte with this during this lovely season. I want to make the Strawberry Melon Energy Blast smoothie! The Cinnamon Dulce Ninjaccino sounds amazing! I went to their site and I would love to make the coffee nog recipe. Drunken pumpkin spice latte sounds amazing! I like the built in frothier. I keep seeing this on commercials, and I want one so bad! That machine looks genius! And the mocha looks even better! White peppermint mocha is my FAVORITE. every now and then a splash of raspberry. Their coffee not sounds really good though. I want this machine so badly!! Oh To make my own lattes or cappuccino at home! It would be a dream come true! I would make the coffee nog first. I would so love this as I don’t have a coffeemaker right now. I would love the French Vanilla Cream Forte and Iced Americano, then Coffee Nog for the holidays! Yum! I would like to try the Pecan Praline Ninjaccino. I would love to make some coffee, or a classic hot chocolate! Iced Vanilla Latte for sure! Milk and Honey Coffee sounds great to me. i’d try the pecan praline ninjaccino! lol! Love the photos – and the recipe! So festive! The southern sugar cookie iced coffee! Yum! I would like to make the Iced Nutty Cocoa Latte. Yum! The coffee nog recipe looks splendid. I want too make the iced Americano! Coffee nog for me for sure!Yum! I would make the Southern Sugar Pie Iced Coffee! The Cinnamon Dulce Ninjaccino sounds amazing!! I would love to make that plus a bunch of other coffee drinks. I think my friends and family would be pretty jealous! Really hoping for this !!!!! I would love to make the White Chocolate Hazelnut Iced Coffee. The Caramel Macchiato Forte sounds amazing! That would be the first thing I make if I win! The Cinnamon Toast Coffee sounds interesting. I would try it. They all look delicious but I’d love to try the Coffee Nog for Christmas! I would love to try the Silk Road Coffee recipe. What a great site. I did not know that Ninja had all of these recipes. I’d love to try the Southern Sugar Pie Iced Coffee. Thanks for the giveaway! Iced Nutty Cocoa Latte sounds good! Cinnamon Caramel Iced Coffee and the Peppermint Mocha as well!!! I would definitely make the Peppermint Mocha. I would make the cinnamon caramel iced coffee! The coffee cookies n’ cream frappe sounds delishes! Thanks for the chance! Happy Holidays! I would love to make the Double-Shot White Russian! Perfect for that “dessert” time goodie! I would like to try the Banana Split Frozen Treat recipe. I’d like to make the Cinnamon Toast Coffee. Oh boy, that would be really good right now! i would make the silk road coffee. I would love one of these. I make ice coffee and hot chocolate for my granddaughter. She loves it but I do it the old fashioned way. Pecan praline ninjaccino sounds like a fun one to try. I would love to try the Cinnamon Caramel Iced Coffee! That Frozen Joe recipe looks delicious ! Oh my gosh! Love peppermint mochas! This is definitely what I would make! Second would be the Silk Road, sounds so interesting with all those spices… or maybe the Mexican spiced, or the… yup, too many to try!